Man Glaze Fuggen Ugly is a matte polish. Comparable to what OPI calls their Suede line. The difference in matte vs. suede is matte is a creme and suede is a shimmer. 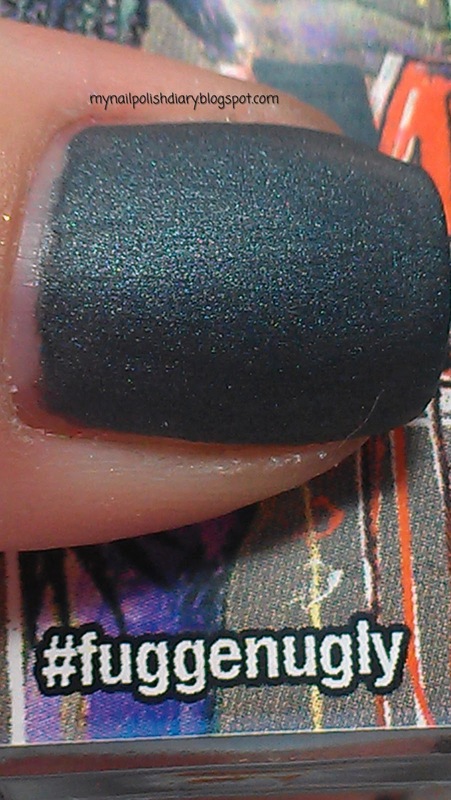 As you can see in the lovely grey coloring is silver shimmer. I really love this one. Suedes or mattes with shimmer are my favorite. In fact without the shimmer I don't really care for matte. The application on Fuggen Ugly was superb. You do have to apply it quicker than you would a normal polish because it does dry so fast. I don't mind! I love the fast drying aspect. Man Glaze polish can be purchased here. Keep in mind they have adult content on their site. If you're easily offended you might want to proceed with caution. Also, if you're worried about the adult nature of the polish names, you can buy them with non adult names.